Dozens of dogs will be hanging out on a busy Chicago block this week, and you can play with them – without it even being weird. Two metered parking spaces in River North will be transformed into a dog-friendly area on Friday as part of a global movement calling attention to the need for more open space in cities. From 7 a.m. until 3 p.m., the pop-up park will feature a rotating cast of adoptable dogs from the Chicago-based Anti-Cruelty Society, which invites the public to stop by and play with its four-legged friends. A parade of puppies and dogs is planned for 11:30 a.m. near the two “BARK(ing) Spots” in the 100 block of West Illinois Street. “People are welcome to come by, pet the dogs, hang out, enjoy the space and learn about the animals if they’re interested in adopting,” said Colette Bradley, media and communications manager for The Anti-Cruelty Society. The event is part of PARK(ing) Day, a movement that began in 2005 when a San Francisco art studio converted a single metered parking space into a temporary public park. Since then, the initiative has expanded worldwide, bringing together artists, activists and others every third Friday in September to temporarily transform city parking spots into public spaces, which have included free health clinics and bike repair shops, farms and parks, and even the site of a wedding ceremony. Bradley said ACS had not participated in the initiative previously but was approached for this year’s event by Chicago urban planning firm The Lakota Group, a regular participant in PARK(ing) Day. 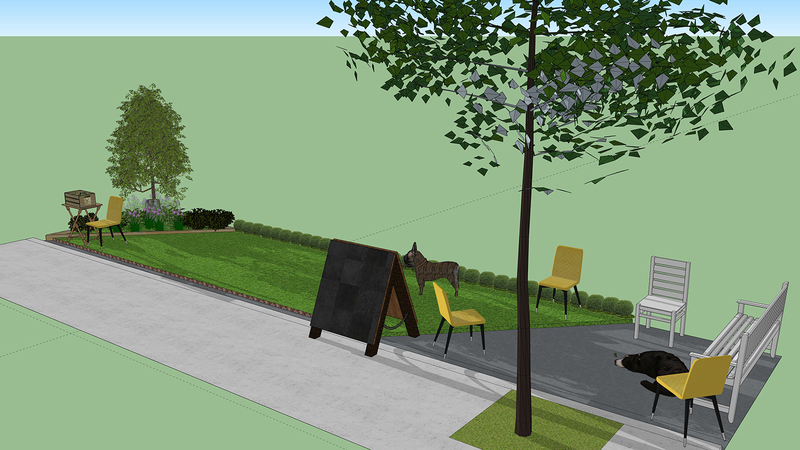 The company worked with ACS to design the “BARK(ing) Spots,” which will feature trees and other landscaping, benches and chairs for seating and, of course, the dogs. “We want to bring awareness to dogs and adoption and everything that we’re doing, but also that this is an environmental [initiative], and animals are part of the environment,” Bradley said. The Lakota Group noted that most space in Chicago and other cities is dedicated to vehicles, which can have a negative impact on residents and animals. “When we look at our River North neighborhood and consider what it is lacking, open space is high on the list,” the company wrote in a blog post on its website. Lakota Group principal Kevin Clark said PARK(ing) Day is meant to re-examine the way urban space is allocated. “As our cities continue to change, reducing the area allocated for private, empty vehicles will open an immense amount of space, and with it opportunities to make vibrant people-oriented places,” he said in a statement.